1 O'Clock combo delivered West-coast jazz with vibes and vocals. 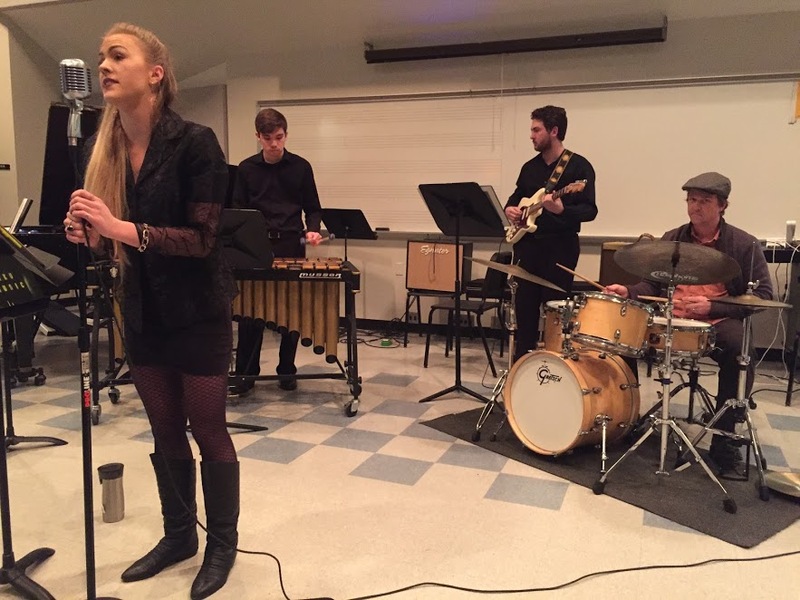 NKU’s School of the Arts (SOTA) hosted a jazz performance on Feb. 8, which included two student bands led by university music professors. The performance, which was attended by more than 50 people, took place in the Band Room of NKU Fine Arts Center. The show was divided into two sessions and showcased various sub-genres within jazz that originated in different locations and times throughout the 20th Century. The first group, 1 O’Clock Combo, focused on a style known as West Coast Jazz, which developed in Los Angeles in the late 1950s. The band included a vocalist, piano, vibes, guitar and a drummer. The second group—11 O’Clock Combo—focused on Straight-ahead Jazz that developed around the 1970s and is often referred to as smooth jazz. The band included tenor sax, alto sax, guitar, bass, drums, a vocalist and trumpet. John Zappa, an NKU adjunct jazz trumpet professor, teaches 11 O’Clock Combo and played leading drums during the second part of a performance. He said that his class played what most jazz musicians or listeners call Straight-ahead Jazz; however, students are more so exploring the different styles and have not clearly defined their own yet. Zappa teaches music at NKU, as well as at the University of Cincinnati College-Conservatory of Music (CCM). According to music-schools.startclass.com, CCM ranks in 20th place in music colleges nationwide, whereas SOTA currently has no ranking. However, Zappa believes that SOTA could reach this level of acclaim. A program for the Jazz combo performance. Sophomore music technology major and 1 O’Clock Combo pianist Charlie Lefkovitz has played music since he was eight years old. He said that, for him, jazz is a tradition that is created by many disparate people who have come together to create this music. 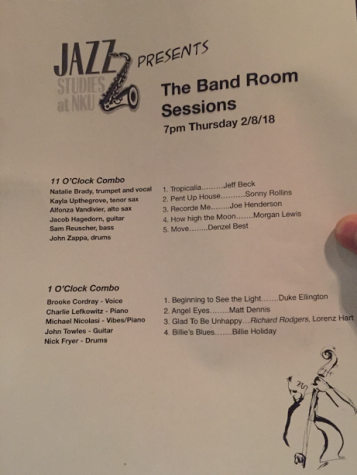 The names of both groups refer to the time slots of a “Jazz Combo” class that performing students attend on Mondays, Wednesday, and Fridays throughout the semester. Students also get an opportunity to perform and practice in front of the audience twice a semester. The next jazz performance will take place in Fine Arts Building March 1 at 7 p.m.
All upcoming event dates and information can be found on the official SOTA School Of The Arts web page.